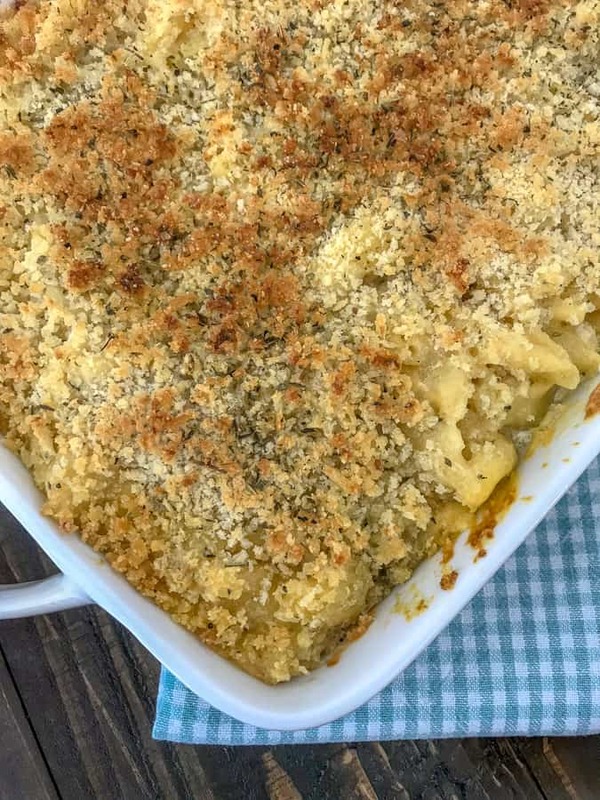 Baked Macaroni and Cheese – the ultimate macaroni and cheese! 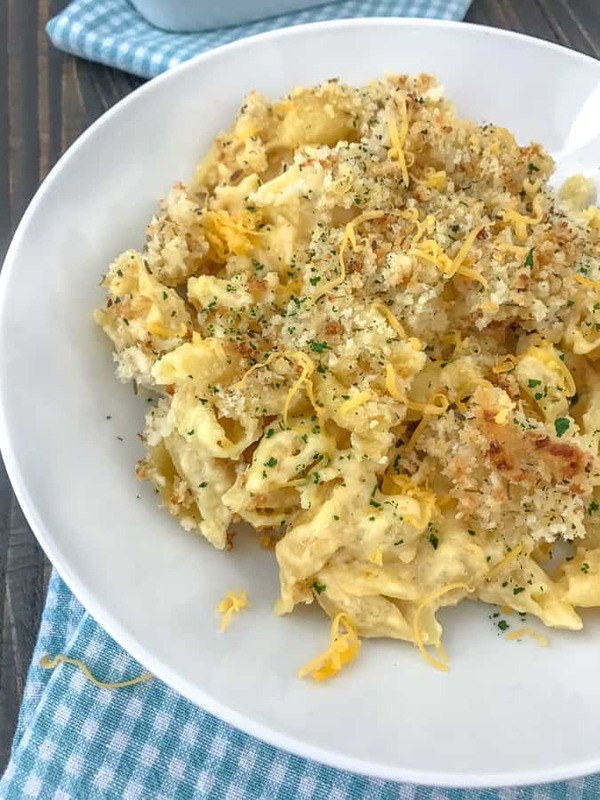 Creamy and cheesy the way macaroni should be and baked to perfection with a crispy, buttery breadcrumb topping. If you’re seeking comfort food, then look no further! The ultimate comfort dish! One of my favorite meals as a kid and still is to this day. It brings about all the comforts a meal should have and in such a sinfully delicious way. 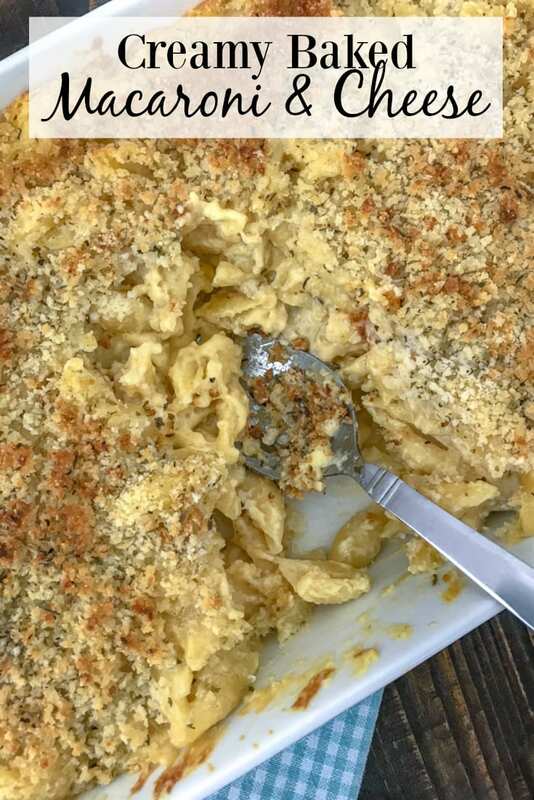 This Baked Macaroni and Cheese is very easy to make and sure to be a hit at your dinner table. Especially with the kiddos! Because what kid doesn’t like mac n’ cheese?? My favorite part of this dish has to be the golden and crispy, buttery breadcrumb topping. It gives this dish an extra layer of flavor. I do recommend trying this with grilled chicken, bacon or lobster, for added protein, as well as adding even more flavor. Choose a pasta that has deep grooves or ridges – something that will soak up and hold on to the thick, creamy, cheesy sauce. This recipe calls for shells, but you can use elbow (traditional pasta used), farfalle (bowtie pasta), rotini, orecchiette, campanelle, etc. Cook the pasta in salted water. One of the best things I can recommend with cooking any pasta. It keeps the pasta from sticking and helps with the cooking process. Don’t buy pre-shredded cheese! Shred your own! It will not only melt much better than pre-shredded, but you can also avoid the chemicals they put on pre-shredded packaged cheese. This recipe calls for extra-sharp cheddar cheese. I love a sharp cheese. But this can easily be swapped for monterey-jack, colby, gruyere, white cheddar, hevarti, etc. Stick with a sharp cheese. 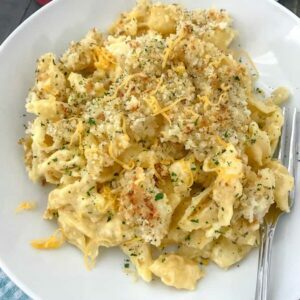 You can use mild cheese, but keep in mind that it won’t have that punch of flavor that traditional mac n’ cheese does. So combine it with a sharp cheese. If your sauce starts to thicken too much – add a splash of milk. If it’s a touch too thin – add a bit more cheese. Panko breadcrumbs are used in this recipe, as they are a coarser, larger texture than traditional breadcrumbs. If you don’t have panko, you can certainly use regular breadcrumbs. If the breadcrumbs are seasoned, omit the salt and italian seasoning. Lemon Garlic and Feta Pasta Salad – a great, filling pasta dish that is perfect for parties or gatherings! Easy to make and full of flavor! Spinach Dip Stuffed Portobello Pizzas – looking for a lower-carb way to enjoy pizza? Try these portobello pizzas with a twist! They are stuffed with a creamy spinach dip and then topped with pizza toppings! YUM!! Honey Garlic Chicken Lettuce Wraps – another low-carb, flavorful chicken dish. So easy to make and great for meal prep! Easy Tender Instant Pot Turkey Breast – the best and easiest way to prepare a turkey breast! Have the turkey and gravy ready in just over an hour! Easy One Pot White Chicken Chili – an incredible chili that is made in one pot! One of the most popular recipes on my blog and perfect for these chilly autumn/winter months! 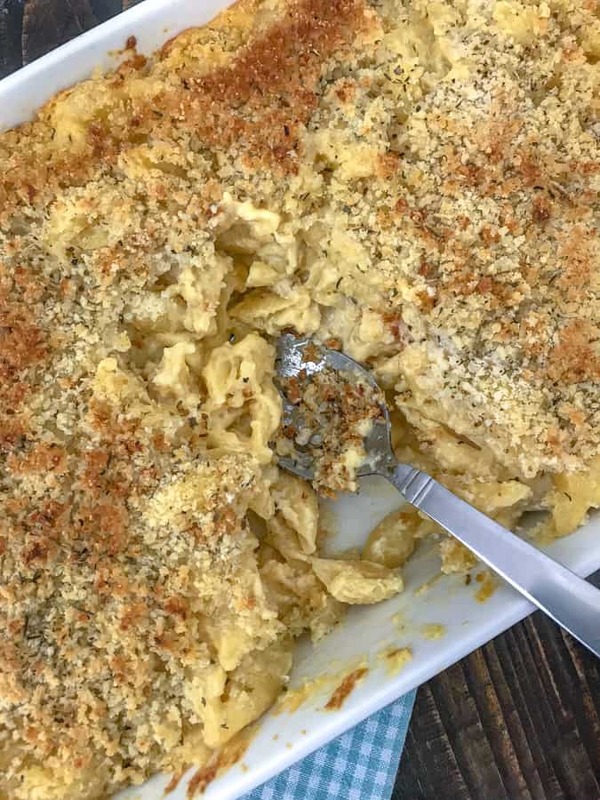 The ultimate Baked Macaroni and Cheese! 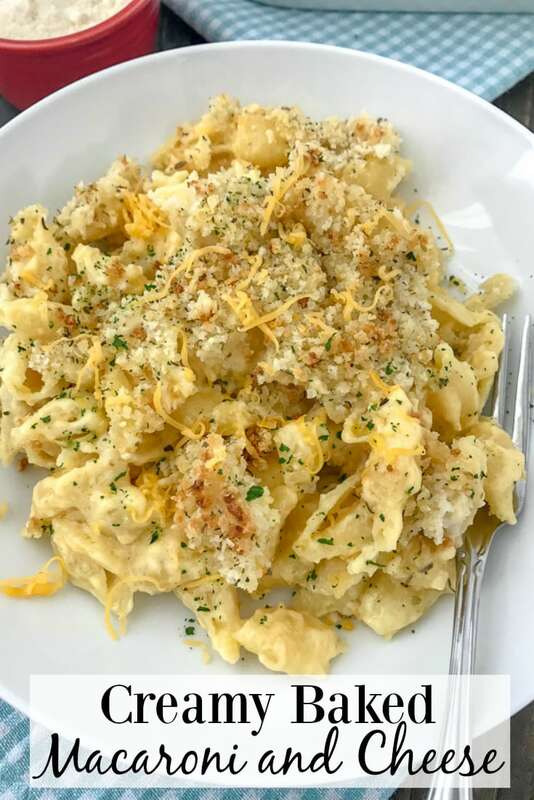 Creamy and cheesy the way mac and cheese should be, with a delicious, crispy, buttery breadcrumb topping. Sure to be a hit at your table as a main dish or side dish option! Preheat oven to 350 degrees F. Lightly grease a 9 x 12 baking dish. Bring a large pot of salted water to a boil. Stir in the elbow (or macaroni) pasta; cook until al dente (check the package for correct time, pasta varies). Strain well and pour the noodles back into the pot. Toss with the olive oil or butter to thoroughly coat. While the pasta is cooking, place a large saucepan over medium heat with butter. Once the butter has melted, stir in the flour and mix until no longer clumpy. Add in the milk, salt, pepper, garlic powder, onion powder, paprika, and ground mustard. Whisk until smooth. Cook, whisking consistently for 4-5 minutes, or until the sauce has thickened to a cream-like consistency. Remove from heat. Stir in the shredded cheese. Taste test to adjust seasonings (salt, pepper, etc) to suit your preference. Pour the sauce into the pot with the pasta and stir to thoroughly mix. Transfer the macaroni and cheese to the prepared baking dish. Sprinkle with the breadcrumb topping. Bake for 20-22 minutes or until the top is a light, golden brown. CHEESE: You can substitute with monterey-jack, colby, gruyere, white cheddar, hevarti, etc. Stick with a sharp cheese. You can use mild cheese, but keep in mind that it won't have that punch of flavor that traditional mac n' cheese does. So combine it with a sharp cheese. SAUCE: If your sauce starts to thicken too much - add a splash of milk. If it's a touch too thin - add a bit more cheese. 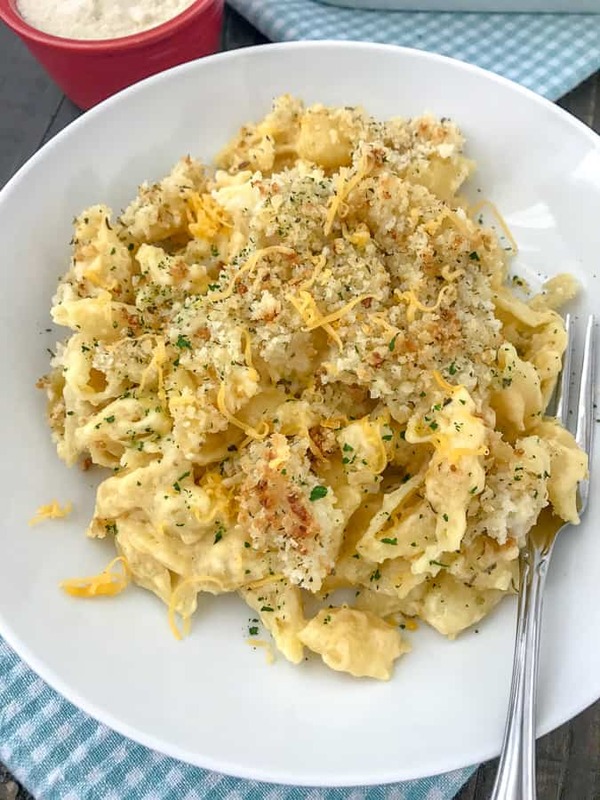 BREADCRUMBS: Panko breadcrumbs are used in this recipe, as they are a coarser, larger texture than traditional breadcrumbs. If you don't have panko, you can certainly use regular breadcrumbs. If the breadcrumbs are seasoned, omit the salt and italian seasoning.